Tunnel Science – Download FREE Printable Science Reading Comprehension Worksheets for Kids. This fun search a word puzzle game is great for kids in Grades 1-5 as well as Pre-K and Kindergarten kids. Our hidden words activity sheet teaches kids fun facts about tunnels in an easy way that even young kids can enjoy. Pre-K kids and Kindergarten kids can use this free hidden-and-missing words puzzle about tunnels as a listening comprehension activity. Grammar school kids can use this activity sheet as a fun reading comprehension activity. EasyScienceforKIDS.com is one of the best free teacher resources for kids science worksheets. We have many free fun science worksheets for kids and online word search puzzles. 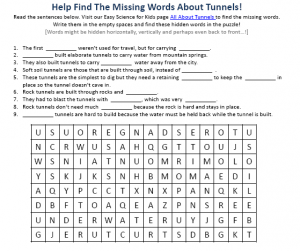 This word search worksheet can be used as a supplement to your science lessons on tunnels. What types of tunnels are there? What do you know about tunnel construction? Throughout the years, tunnels have been built for different purposes. Some tunnels were made for transporting water, while other tunnels were build to enable people to travel. Find out more tunnel information and fun facts about tunnels by downloading the activity sheet! [sociallocker]Download the fun printable easy science worksheets about tunnel science. Download the Tunnel Science Worksheet! Liked the Tunnel Science worksheet? Find lengthy scientific information on tunnels here. Declan, Tobin. " Tunnel Science - Download FREE Printable Science Reading Comprehension Worksheets - ." Easy Science for Kids, Apr 2019. Web. 23 Apr 2019. < https://easyscienceforkids.com/tunnel-science-download-free-printable-science-reading-comprehension-worksheets/ >.